It is specifically designed for the Nokia Lumia 720 as the hard cover includes specialised cut outs to allow easy access to all of the phone's ports and features. The Nokia hard cover has a slim fitting back cover which easily snaps over the back of your device to protect the rear of your Nokia Lumia 720 from dirt, scratches and minor impact damage. Manufactured by tough and hard wearing polycarbonate, this extremely lightweight case ensures that your Lumia 720 can withstand the knocks of everyday use. 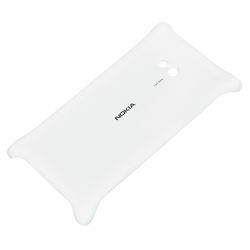 The primary feature of this charging shell is that it promotes use of your Lumia 720 with any wireless Qi induction charger such as Nokia Fatboy Pillow Charger or the Nokia Wireless Charging Plate.